At the height of its glory, San Gimignano's patrician families had built around 72 tower-houses as symbols of their wealth and power. Although only 14 have survived, San Gimignano still retains its feudal atmosphere and appearance. 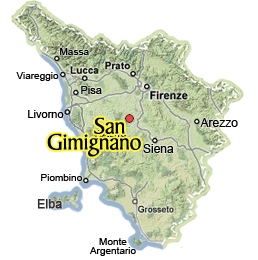 Here is pratical information on how to get to San Gimignano, whether you have a car or need to get there by train or bus. Where to Park in San Gimignano? If you're driving to San Gimignano, you'll also need to park! Here we have details on the parking lots on San Gimignano. Stay clear of street parking since it is reserved for residents. Based in San Gimignano for your Tuscan vacation? Here are 10 places to consider adding to your itinerary to get a 360° vision of this beautiful land. Discover small towns, vineyards, fortresses and stunning landscapes. At the height of its power, San Gimignano had over 70 tower-houses and became a reference point for anyone traveling along the Via Francigena road and pilgrimage route leading to Rome.